It is now established that subcritical mechanisms play a crucial role in the transition to turbulence of nonrotating plane shear flows. The role of these mechanisms in rotating channel flow is examined here in the linear and nonlinear stages. Distinct patterns of behavior are found : the transient growth leading to nonlinearity at low rotation rates $Ro$, a highly chaotic intermediate $Ro$ regime, a localized weak chaos at higher $Ro$, and complete stabilization of transient disturbances at very high $Ro$. At very low $Ro$, the transient growth amplitudes are close to those for nonrotating flow, but Coriolis forces assert themselves by producing distinct asymmetry about the channel centreline. Nonlinear processes are then triggered, in a streak-breakdown mode of transition. The high $Ro$ regimes do not show these signatures ; here the leading eigenmode emerges as dominant in the early stages. Elongated structures plastered close to one wall are seen at higher rotation rates. Rotation is shown to reduce nonnormality in the linear operator, in an indirect manifestation of Taylor-Proudman effects. 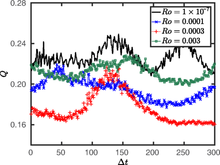 Although the critical Reynolds for exponential growth of instabilities is known to vary a lot with rotation rate, we show that the energy critical Reynolds number is insensitive to rotation rate. It is hoped that these findings will motivate experimental verification and examination of other rotating flows in this light.